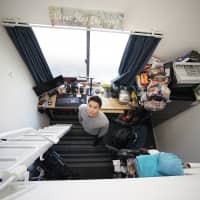 Wearing a headband and tracksuit, Satoshi Tsumabuki — the 31-year-old darling of the Japanese entertainment world — was easy to spot among a crowd of actors in a rehearsal studio in downtown Tokyo recently. 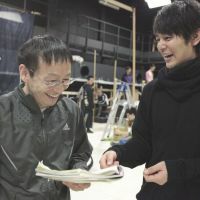 He was there preparing for “Egg,” Hideki Noda’s new play, which opens Wednesday at the Tokyo Metropolitan Theatre (TMET) in Ikebukuro in the first programme after the theater’s 17-month refurbishment. 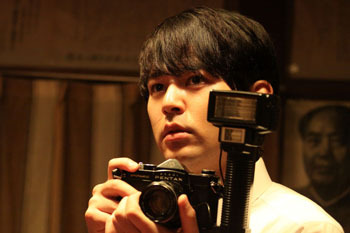 Tsumabuki is one of Japan’s biggest TV-drama and film superstars. And though this is only his third stage role, judging from his first two forays — the Noda plays “Kiru” (2007) and ” Minami-e” (“To the South,” 2011) — many see no reason why he shouldn’t reach dizzy heights in theater as well. It’s between those choc-a-bloc shooting schedules that Tsumabuki has managed to shoehorn in time as Hirafu Abe, the hero of a fictitious sports team in the upcoming two-month run of “Egg.” In fact Noda offered Tsumabuki this role last year right after they finished working together on “Minami-e” (“To the South”), his play exploring mass hysteria and the culture of secrecy in Japan. In casting Tsumabuki, there’s no hiding the fact that Noda has an eye for business as artistic director of the publicly funded TMET. 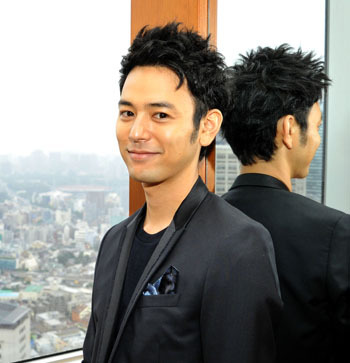 Back in 1996, Tsumabuki’s career started in real fairytale style with a nationwide male-only talent search dubbed “Ahopon Project.” Organized by three major showbiz companies — Amuse, Horipro and Nippon Broadcasting System — this kicked off by getting all 24,016 applicants to compete in an arcade game in which luck played a part. A shortlist of the top players then received tickets to attend serious auditions through which the huge field was narrowed down to just one winner — the then 16-year-old Tsumabuki. 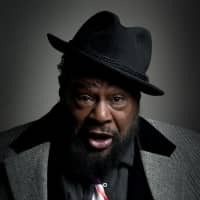 The next year, his career began with small film and TV-drama roles in which he stood out so much that he was soon fully booked as a film and TV actor. Now, at age 31, he’s already played roles that some spend their entire careers working up to, such as that of the samurai hero of NHK’s prestigious annual year-long history drama (General Kanetsugu Naoe in 2009’s “Tenchijin”). His film roles have also made him a regular nominee for Japan Academy awards, leading him to scoop the best actor prize in 2010 for his role as the anti-hero Yuichi Shimizu in the eponymous film of Shuichi Yoshida’s crime-noir novel “Akunin” (“Villain”) directed by Lee Sang Il. Until I was 7 or 8 years old I was living in Yamato-gun, which is now part of Yanagawa City in the Fukuoka Prefecture of Kyushu. Though I don’t have so much memory of that time, I went to an elementary school that had a policy of pupils spending all day every day barefoot. I was so comfortable, and I think that school — called Mitsuhashimachi Fujiyoshi elementary school — gave a well-balanced education. 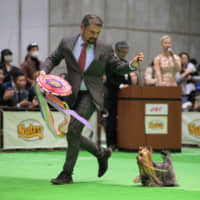 Now, I look back and realize how such rustic ways built my character in a sense, and that my childhood in Fukuoka definitely remains an archetypal image in my mind. In fact, it’s only recently that I started to reflect on all that — after going to see the site of the family house in Fukuoka that my father had built but then let out after we moved to Yokohama in Kanagawa Prefecture. The house was pulled down some years ago after it fell into disrepair, and when I saw the empty place where it had been I was bitterly disappointed. In my memory, that house was huge and modern and was like a dream castle. But the vacant plot looked very small and it was covered with rubbish and discarded cans. I nearly cried when I saw that, and straightaway I told my parents that I would build a great house for them. That obviously shocked you very deeply. Yes it did. I’d had an easy life and I never had any materialistic desires. Then, for the first time, I strongly longed for something and vowed to myself that I would buy a house for my family. Until then, every day I’d simply enjoyed my job as an actor and just blindly worked hard on what I was doing. But I thought over my life at that moment, and realized that if I just single-mindedly focussed on acting I might lose lots of important things without even noticing. Have you ever considered doing anything other than acting? I’ve never ever had such a thought. At first, I thought an actor’s job was easy and anyone could do it if they wanted. That was because I unexpectedly won a big nationwide audition for newcomers when I was 16, and then became a professional actor in major media straight after that. I therefore imagined acting was a pretty simple job and I didn’t think there was anything special about it. After all, I had managed to do almost everything I’d wanted to do well enough — whether studying, playing sports or making friends — so I didn’t take acting especially seriously. Do you still think acting is “a pretty simple job”? No. On the set of my first film shoot I found that I couldn’t do anything right or make any movements as an actor should. That was a huge wake-up call. Ever since, I’ve just struggled and tried to be a better actor. I think actors are never really satisfied with their work because their aspirations get higher and higher the more experienced they become. Today, acting is certainly a great part of my entire life, and I can’t imagine doing anything else, but I think the task of acting goes hand in hand with my private life. So, as I become more mature as a person, I believe the acting part of me will develop at the same time. Do you get much free time to yourself? Yes, I have quite a lot of time to do as I please. If I get enough of a break from work, I always like to go somewhere with my family. I’m single, so it’s great to take my parents abroad. I want to show them many places and things, and I also want to share such experiences with them. I am very close to my family and I don’t feel ashamed of saying that. I will openly tell my friends, “I have a date with my mum today:’ Yes, I certainly am a mommy’s boy (laughs). I used to go out drinking with my friends in my free time, but since I turned 30 I prefer to spend time by myself at home instead. At such times, I often draw and paint with pastels and acrylics. That’s just a hobby, though, so I don’t have any plans to have an exhibition or anything like that. As a leading figure in the young generation of actors, how do you perceive your role in the Japanese entertainment world? I don’t want to have any fixed limitations or expectations regarding my selection of work, and I want to try any roles offered to me that arouse my interest. The role of the hero, or antihero, in “Akunin” (“Villain”) directed by Lee Sang Il, was one of the most important jobs in my career. As I got deeply involved in playing Yuichi, a lonely outcast who murdered a woman and was on the run with a social misfit named Mitsuyo (Eri Fukatsu) who he’d met through an online dating site, I thought about the character every moment of the day and I was totally burned out when the filming finished. However, that experience finally made me realize that my job was primarily just “acting,” and that I should stand back from other issues I’d concerned myself with — such as the burden of responsibility for a production’s success if I was in the main role, or how to get a theme or message across to the audience — and entrust those to the director or the other staff. Once I realized that, I was able to concentrate more on my acting. After that I took on the role of the hero Norihei Minami in Hideki Noda’s play “Minami-e” (“To the South”). That is set at the time of a catastrophic disaster due to a volcanic eruption, and it talks about fabrications of the media and the public’s uncaring, unquestioning acceptance of those fabrications. 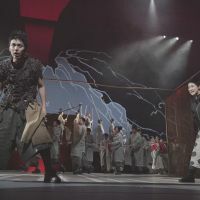 In an unhappy coincidence, the Great East Japan Earthquake of March 11, 2011, happened during the play’s run, and performances were actually canceled for a few days. Many people were debating whether or not theaters should close during a time of such importance to the nation, but I personally didn’t have any doubts about continuing the performance and doing my duty on stage. I believed that to act was the best and only thing I could do by way of encouraging, for example, the victims in the northeastern Tohoku region. What is it like working with Noda? Your role in his new play “Egg,” which begins a long Tokyo run on Sept. 5, will be your third time working with him, won’t it? Indeed. 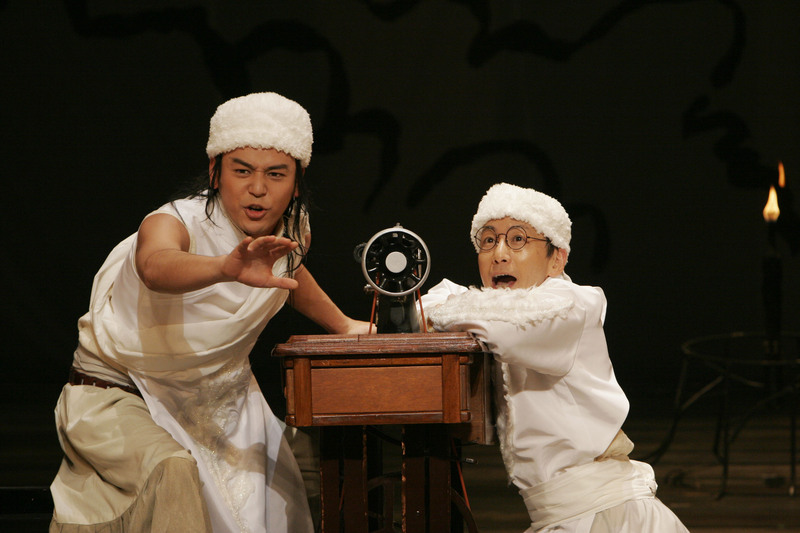 I had a very intellectual image of Noda before I worked with him for the first time in a re-run of his play “Kiru” in 2007, which was my first experience of live theater acting. However, when I joined his workshop for that performance, I was surprised to find it aimed much more at a physical and bodily understanding of the work than a cerebral one. It was like playing, but that physical, game-style of workshop made everyone feel free to naturally take a positive attitude toward individual expression. So Noda’s creative process has always stimulated me, and I always enjoy working with him. Also, as I am not very dexterous, I had a tendency to be overly theoretical about texts and lose my way, but when I work with Noda I can be more relaxed and natural in approaching the role and rely on his direction. Usually, he gives the actors lots of freedom and lets us do what we think we should. When I played the role of the hero, a Mongolian fashion designer, in “Kiru;’ I just threw myself into it wholeheartedly because it was my first-ever theater acting experience and I didn’t know how else to approach it. In one day’s performance I strangely felt as if I could see a vast blue Mongolian sky above my head in the last scene, and I just naturally felt how my character Temujin would have felt to see that and I started crying on the stage. Actually, I thought that wasn’t very good because maybe some of my lines got lost and some people in the audience couldn’t hear them. But Noda didn’t say anything about it afterward, so from then on I felt free to create my own Temujin and I was happy with the role that emerged. What is the difference between film acting and stage acting? In particular, how do you find repeating the same thing every night as you must do in live theater? When I played the hero Minami — my second stage role, which was in “To the South” — Noda told me not to pretend to understand everything. I took him to mean that if I fixed and limited the interpretation of the text, only that restricted, defined message would reach the audience, and that would be boring. So to best present the broader imaginative possibilities of a play, I try to be as flexible as possible toward my role and to bring a fresh mind to every work, every time. 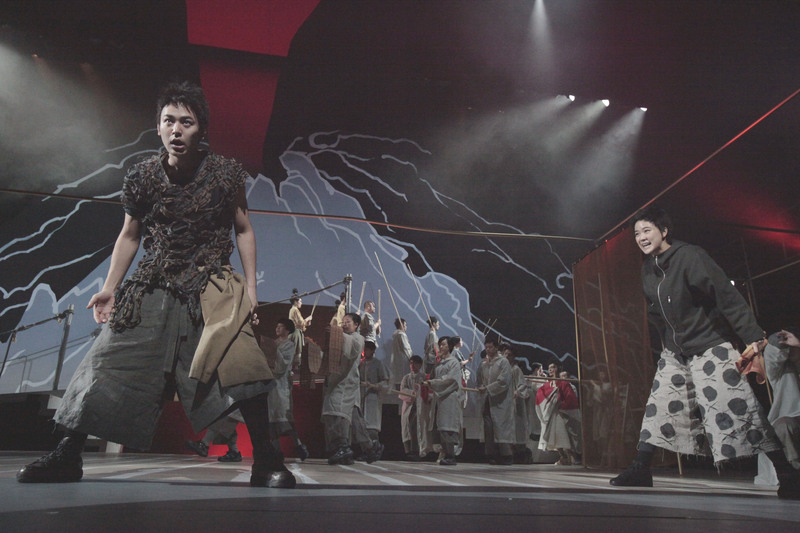 To return to that two-month run of “To the South,” when a few performances were canceled after the Great East Japan Earthquake and tsunami of March 11, 2011: You have said how you felt as an actor, but how did audiences react at that time? The most obvious difference I noticed after 3/11 appeared during an interview scene when the calm, sincere hero, Minami, who I was playing, is surrounded by lots of reporters aggressively pressing him for soundbites in their rush to find simplistic explanations about the volcanic eruption. Before March 11, I just answered the actors playing the reporters on the stage; but after that day, I saw those reporters’ eyes in the auditorium as well, and so I spoke my lines toward the audience. I thought the audience’s state had dramatically changed and they no longer saw what was happening in the play as somebody else’s problem; they saw that scene as if it was happening in their real lives. Actually, we were still experiencing aftershocks on a daily basis when there were also fictional quakes on the stage, and many in the audience were in an emotional turmoil about whether it was okay to have fun or not. So it seemed to me that the audience identified with my words confronting the media rabble as their own. That was when I realized that a performance is not entirely the creators’ work, but that it is completed by involving the audience. This new play, “Egg,” deals with the hysteria surrounding sports and music events, which is timely in view of the recent hoo-ha over the Olympics in London. Did you enjoy the Games? As rehearsals for “Egg” had started, I could only check the results on the TV news. Nonetheless, I was really impressed about the comeback of the backstroke swimmer, Aya Terakawa. [While still at high school she was tipped to be world class, but then fell into a decline before fighting her way back into the national team and winning a bronze medal at London 2012.] Terakawa’s achievement showed the enormous scale of human possibility if you have that kind of wonderful, never-give-up spirit. While Japan’s athletes did well at the Olympics, what can we do, especially people of your generation, to create a better future for Japan as a whole? I don’t think we need to aim as we did before to see “Japan as No.1.” First of all, we should consider carefully what really matters in a much broader sense. 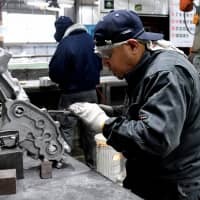 I think this is a good time to reconsider ourselves and discover new merits in Japan, rather than just sticking to the old aim of being an economic leader in the world. Instead of just wishing for more convenience, we should examine more fundamental matters, such as what kind of lifestyle we should be aiming for in the future. 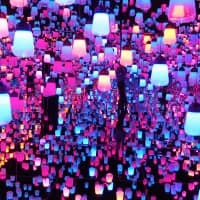 To reach that final goal, maybe we need to put up with a temporary atrophy until we can share a clear vision of the final picture — then we can make that happen. After World War II, the Japanese people made a great recovery; then in the ’60s, many student activists threw themselves headlong into striving for their ideal society. More recently, people were confined to Internet worlds and dispatched their individual opinions into cyberspace, but nowadays social networking through Twitter and blogs has spurred people to take action and create social movements. It is very important to step forward to take action, otherwise nothing will ever change. Last year, when I played a role of a journalist during the radical student movement of the late ’60s in a movie titled “My Back Pages,” I read lots of books about that movement, and I felt how their power of action shook the country. How else did acting in “My Back Pages” affect your outlook? Well, I’m not sure whether Japanese people will produce youth movements on such a scale ever again. However, my experience of acting the role of Sawada, a news reporter, made me think that even though the students couldn’t change the world, I really hope that journalists stick to their faith and never give up questioning things. 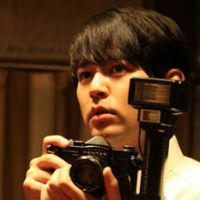 [The movie is based on the real life of a national newspaper reporter named Saburo Kawamoto, who covered the activists’ causes and came to be close to a leading leftwinger (named Umeyama in the film) before abandoning news reporting to become an author.] Whether journalists or other citizens, it’s easy to get caught up in the drift of the times, but I hope each recognizes their responsibility and respects the other and questions their beliefs. What do you think the arts can do for society? If the majority of people say they don’t need plays or movies, then we must just disperse from society. If a war starts again involving Japan, we actors will probably be the first to lose our jobs. However, though it may sound a bit pretentious, I think that to touch someone’s feelings is quite a special thing — and a great thing. It’s the same with sports. We can’t explain why we shed tears if the Japanese volleyball team wins a big match, for example; they don’t give us anything directly. But such inexplicable, powerful emotion proves we are human beings. People can be moved and cry without any clear reasons, and in that I see real human charm and romanticism. People don’t know why they are so moved, but they try to experience such feelings. It’s the same as being in love, even though you can’t say why you love a particular person. Moreover, a person’s passionate “love-vector” can sometimes change its target (laughs). Obviously, humans are dumb in some ways, but that’s part of what makes us charming. Theater and the arts can give people such kinds of intangible excitement. Do you have any future ambition on the stage? That’s simple and clear: I would like to have the experience of working with other directors besides Noda in the future (laughs). Of course, I am lucky to have worked and to be working with such an indemand dramatist, but I want to be open to all possibilities. 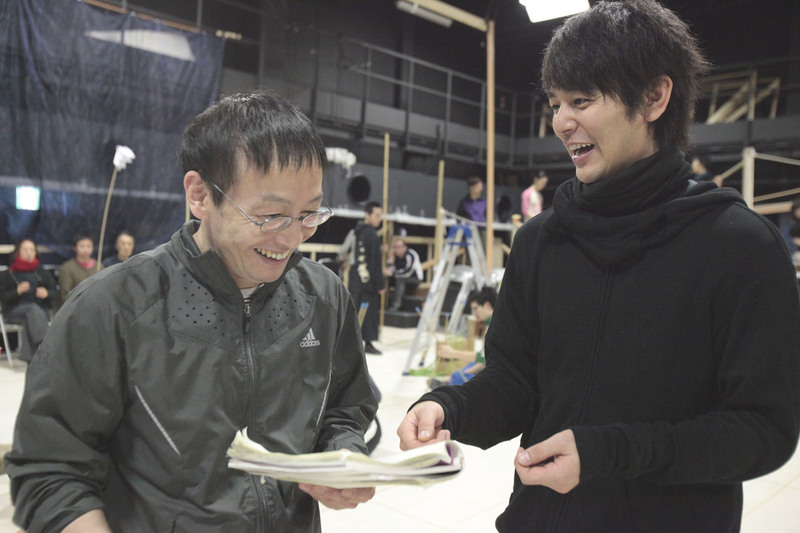 “Egg” runs from Sept 5 till Oct 28 at the Playhouse at Tokyo Metropolitan Theatre, a 3-min. walk from JR Ikebukuro Station. Standby tickets are available every day. 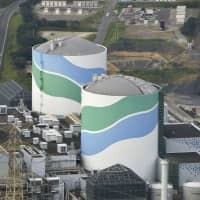 For more details, call Noda Map at (03) 6802-6681 or visit www.nodamap.com or www.geigeki.jp.